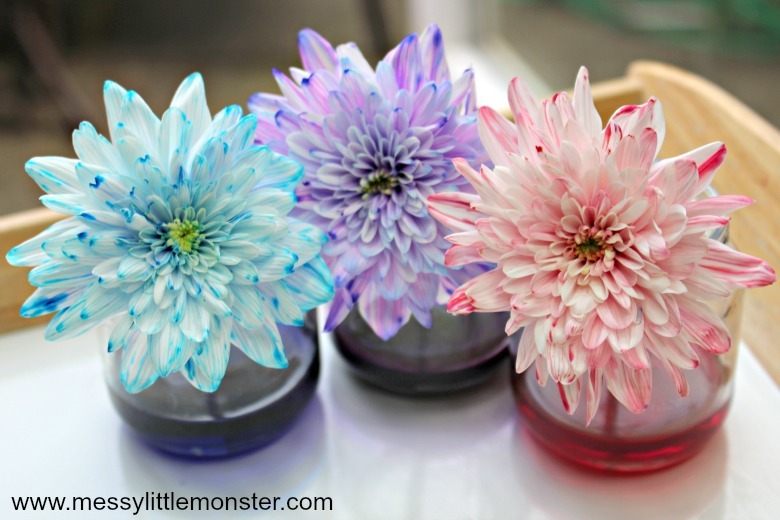 This colour changing flowers science experiment for kids is such a fun science project. Whether you are looking for easy science experiments for preschoolers or for older kids this fun science experiment is perfect. Kids will be fascinated as they watch the flower petals changing colour and learn about how plants drink water! The rainbow coloured flowers look so pretty too! This cool science experiment is really easy to set up and the flowers change colour quite quickly (within about an hour) so there isnt too long to wait to see the change. 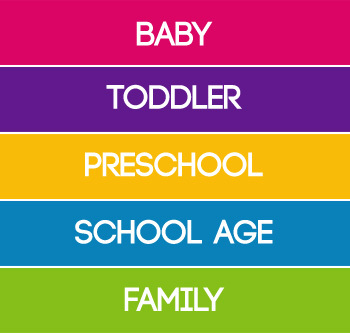 We love easy science experiements, but they have to be fun science experiments too! Here are a few of our favourite science experiments for preschoolers and older kids to enjoy. The skittles science experiment is a favouite as it is really easy to set up and the reaction is almost instant. The magic milk experiment is a lot of fun too, and again kids will be amazed by the reaction that takes place. The rainbow baking soda science experiment is another science project that will definitely capture the kids attention. If you dont mind a bit of mess, playing with frozen oobleck is lots of messy fun and children will learn a lot of science as they play without even realising it! The same could be said for painting with ice paints or getting invloved in some ice play. Learning science through play can be so much fun! The most recent science experiment that we have enjoyed doing was the rainbow walking water science experiment. You could even use the jars of coloured water created from the walking water experiment for the colour changing flowers experiment that we are sharing today. 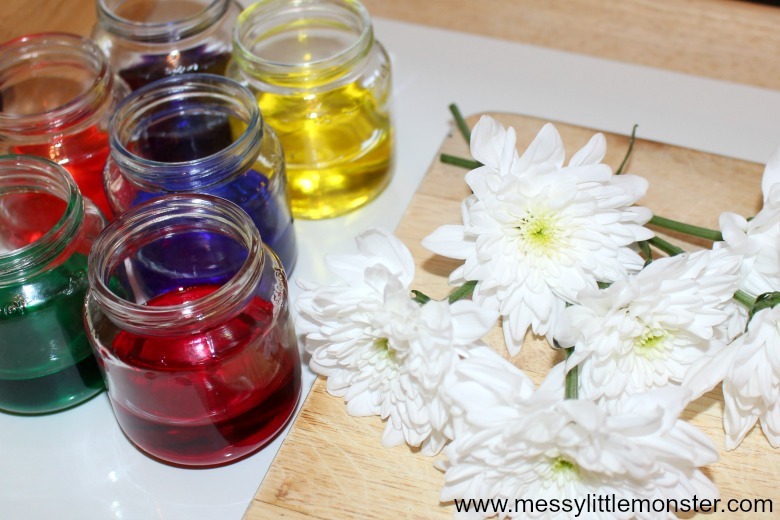 Below you will find step by step instructions for the colour chaning flowers science experiment. This flower experiement is easy to set up with only a few supplies needed. We hope that you have fun with this cool science experiement for preschoolers or older kids to enjoy! 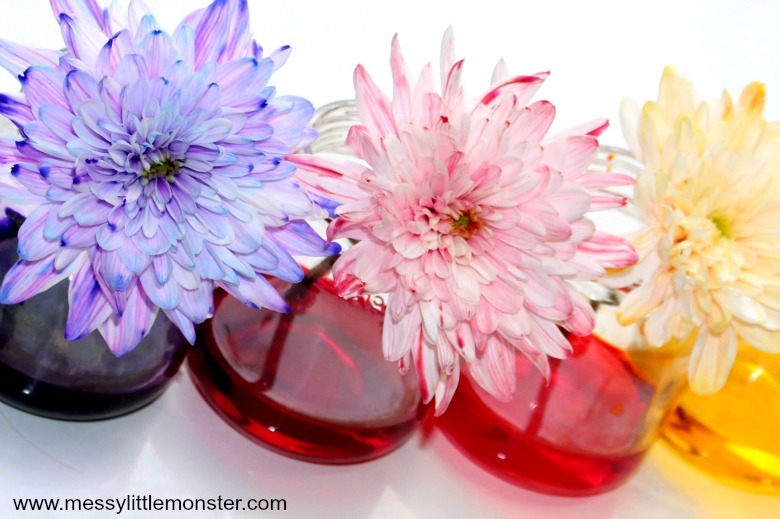 What are the best flowers to use for the colour changing flower experiment? 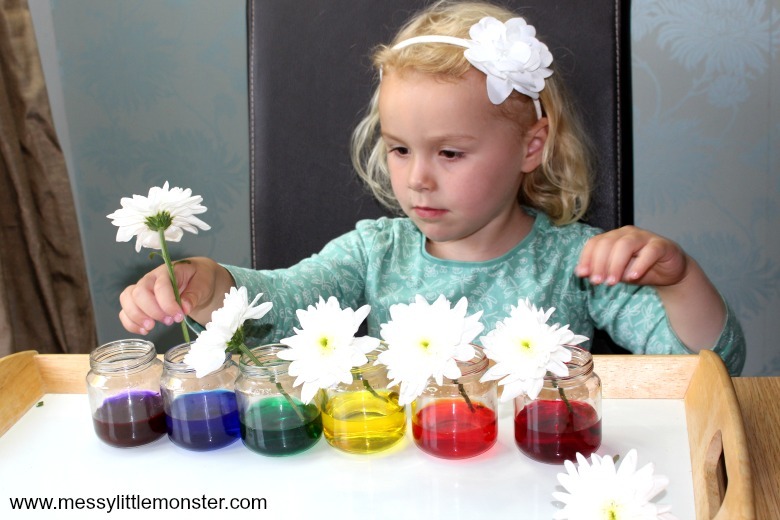 You can use any white flowers for this colour changing flower experiment, we used large white daisys, but you could use white roses or carnations. The important thing is to use white flowers so that you can see the colour changes clearly. Make sure that you cut the stems diagonally across the bottom so they can drink up the coloured water easily. It is also important to make sure that the flowers are fresh, this colour changing flowers experiment won't work so well if the flowers are beginning to wilt. It would be fun to try out a selection of different white flowers to see which work best. Before beginning this fun science experiment it is important to make sure that you have all your supplies ready and to hand. If you are planning to make this an experiment for preschoolers this is extra important as their attention span is shorter than that of older children. Talk to your child about the experiment that you are planning to do and discuss what might happen. You could ask them to draw a picture of what they predict will happen. 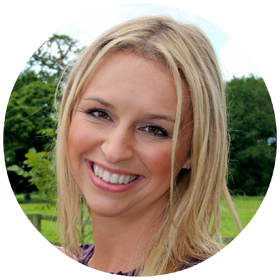 We have included a simple science experiment printable that you could use to record your child's predictions and then later the results. You can find this printable science experiment worksheet if you scroll down below. Pour water about half way in each of the glass jars and then add a few drops of liquid water colour (or food colouring) to each jar. The more colouring you add the deeper the colour on the flower petals will be. 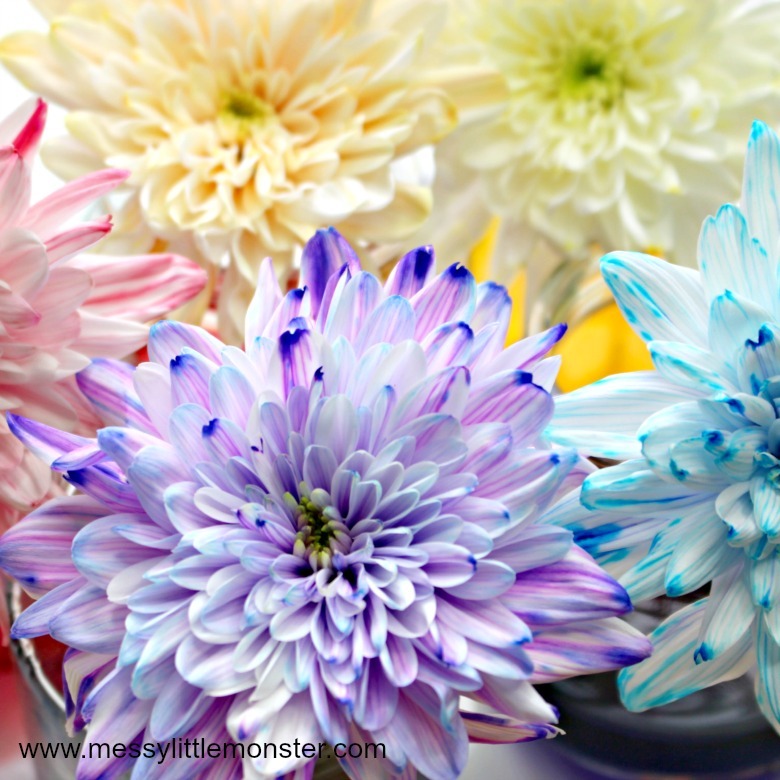 To get brightly coloured flowers like those in the images we added 10 drops of liquid watercolour to each jar of water. 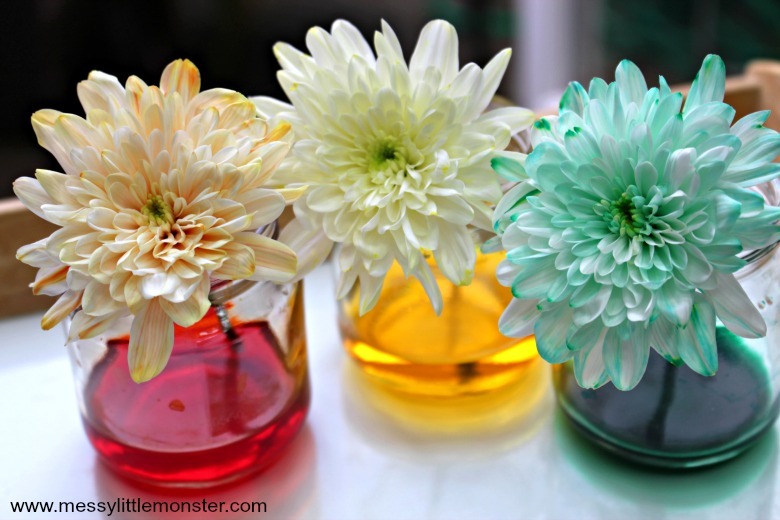 To prepare the flowers for this colour changing flowers experiment you will need to cut them so that they are slightly taller than the jars that you are using. You will need to cut the bottom of each flower with a diaganol cut so that the flower can easily drink the coloured water. Make sure (as mentioned above) that you use fresh white flowers so that you can see the full colour changing effect. Place one flower into each jar of coloured water (or more if you want!) and then watch as the flowers change colour. How long does it take to change the colour of a flower with food colouring or liquid watercolour? The flowers won't change colour instantly, but after an hour or so you will start to see a little colour appearing on the petals. After a few hours the petals will all begin changing colour and if you leave the flowers in the coloured water overnight the colour will continue to get deeper. The flowers in the images below were left overnight. 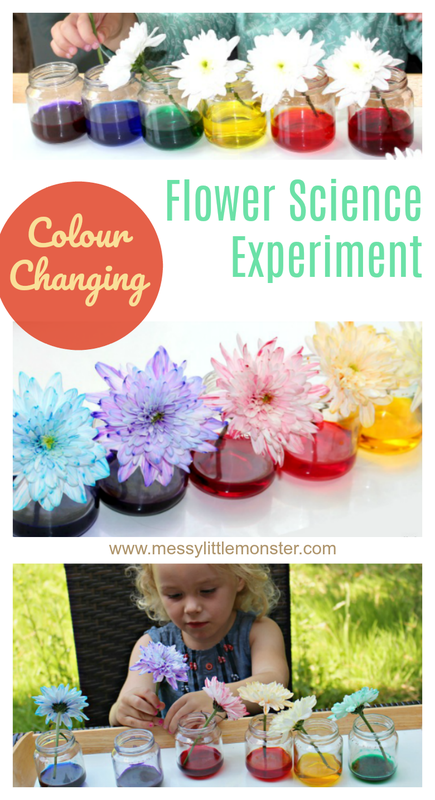 The science behind the colour changing flowers science experiment. This easy science experiment for preschoolers gives you the perfect opportunity to talk to your child about how a plant drinks water. The coloured water used in this experiment demonstrates how water is sucked up through a plants stem and then makes it's way to the different parts of the plant including the flower. 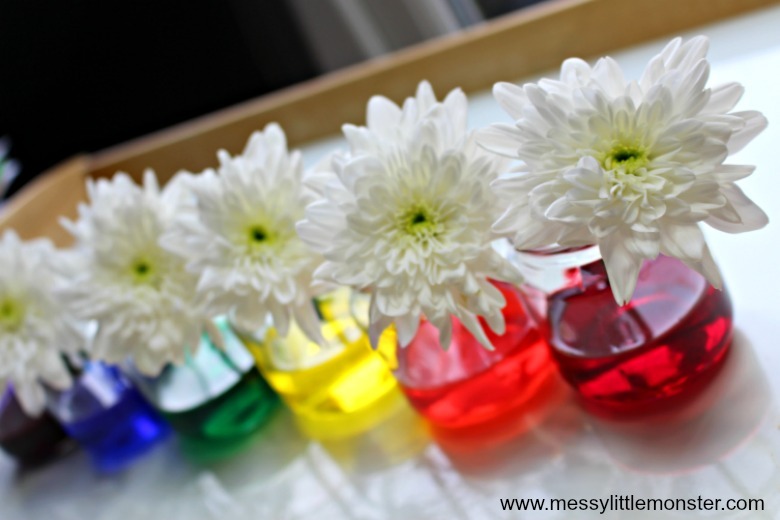 This fun experiment is a perfect beginners science experiement for children who want to learn about how flowers absorb water. Daisy (aged 3) loved that she was able to make her own rainbow flowers. She was especially impressed the following moring when the flowers had changed into brightly coloured flowers. 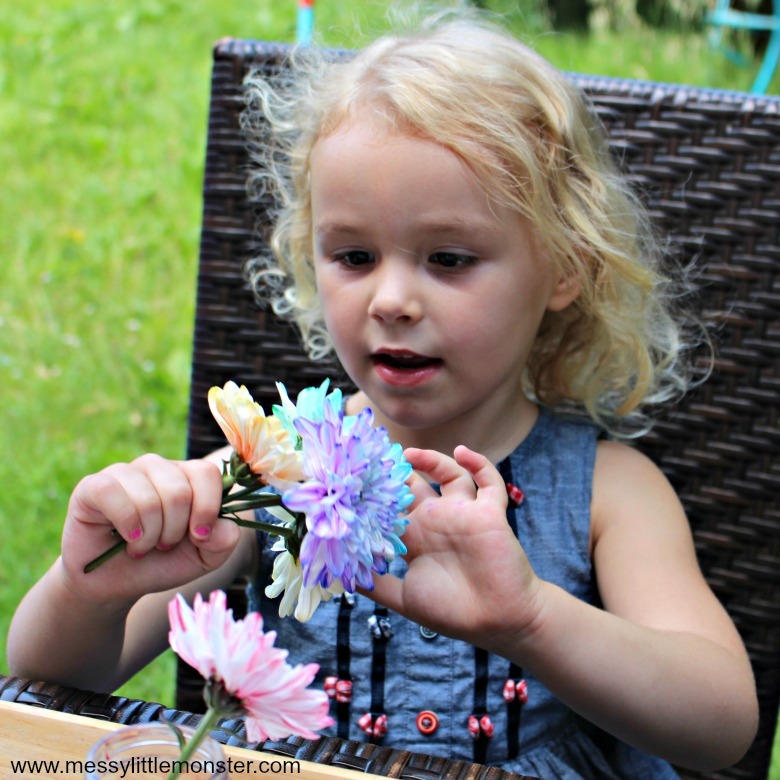 She loved making her own bunch of rainbow flowers before taking them over to her mud kitchen to play with them. 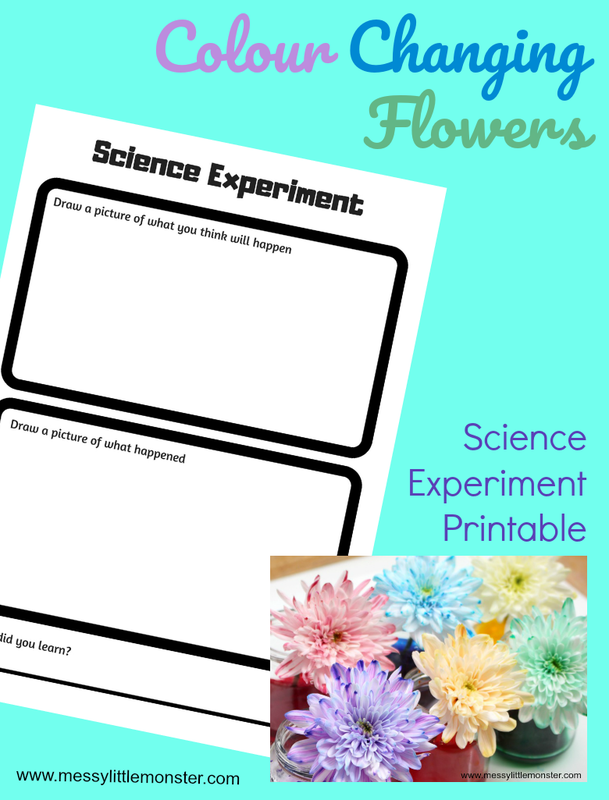 To download this science experiment printable worksheet for free add $0 and click on the 'I want this' box below. It may take a moment for the page to load so please be patient. For personal use only. Not for redistribution. All images are copyrighted. Thank you. 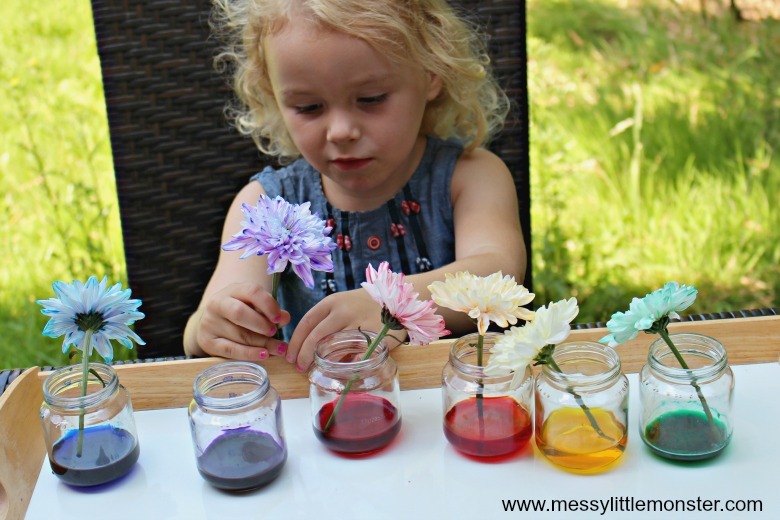 This colour changing flowers science experiment for kids is a perfect beginners science experiment for preschoolers. We hope that your child has had fun exploring and discovering new things as they have tried out this cool science experiement.